Today's WFMW has a theme: holiday/entertaining tips. I have hosted the Thanksgiving meal for several years and have learned a few things along the way. ~ Plan the whole meal well ahead of time. Schedule when to make each dish. Consider what things can be made ahead and think about how long each thing takes to make. Work backward from the time you want to eat to decide when to start each dish. ~ Purchase disposable containers so you can send leftovers home with your guests and they don't have to worry about returning any dishes. ~ Set the table(s) ahead of time. That way when the food is ready, you can just set it out and call everybody over. ~ Be flexible about what time you plan to eat. Give guests a general idea of the time, but don't be too specific. It's SO hard to get everything ready at the same time! ~ If you have appetizers for early guests, keep them light. You don't want everybody to be already full when sitting down to a fabulous big meal. ~ Skip the green salad and maybe even the rolls! For my family at least, there are so many wonderful dishes being served that nobody wants to fill up on salad or bread. I finally stopped serving salad and am considering stopping the rolls because they go uneaten and we end up with too many left over. Are you hosting a Thanksgiving or Christmas meal? What tips do you have? 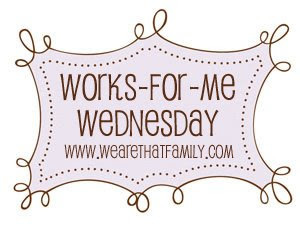 For more Works-For-Me-Wednesday posts, stop by We Are THAT Family! Have a wonderful Wednesday! Great tips! I use most of them already and you covered it well. 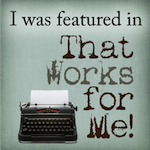 It's so interesting to find your blog...about an hour ago I published a post on chocolate. I used to be a chocoholic until I discovered that it was the cause of my skin being like a burlap sack!! Kathy hosts Christmas dinner so it's fun! Big when you find a turkey at Wal-mart for 40 cents a lb you tend to search for the biggest one on the planet size hugs to you! Great tips - I'm hosting a Girlfriend Thanksgiving Party this Friday. Everyone brings a dish and I'm providing the turkey (in the crockpot), rolls (because homemade rolls are a must at my house) and pumpkin pies. Great ideas! I liked the one of having containers for the guests to take home some of the leftovers. And I am leaning toward not doing the rolls and salad also...too many other good things to eat! We are headed to my dad's for Thanksgiving, but I LOVE doing a turkey myself so I think we will have another turkey dinner sometime in the next few weeks. I think your best tip is about the timing. It really does help! My tip would be to assign serving platters, serviceware and pots and pans to each dish. That way, you will know that you have enough and you aren't running around looking for stuff. I love idea of sending leftovers home with guests!! 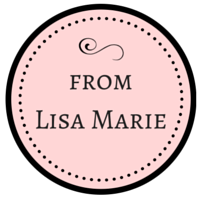 Just stopping by to say thanks for the comment you left on my post over at Sarah Mae's place. Mind-reading is one of those marriage expectations I think we all come in with, eh? It's comforting to know others do it too! 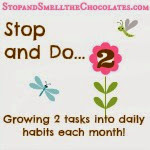 PS: "Stop and Smell the Chocolates" - LOVE that! That's it. I'm coming over to your house this year. Awesome tips! We put the Caesar salad in a metal bowl (but you could use any bowl) and then set that bowl on top of a bigger bowl that's filled with ice. The ice then helps keep the other bowl cold, which keeps the salad fresh. Oh these are good tips. I usually host Thanksgiving and Christmas so I am going to have to put these tips into place. I am really trying hard to be more organized this Holiday season. Great tips! Thanks for sharing!! !I cant wait for the Holidays! Those are all very good tips, thanks!